The state of confusion around the new Xbox One console is such that we're delighted to bring you the news that Microsoft's next console has a power button. What's more: its watchful new Kinect sensor that must be plugged in for the console to run can be turned off. Oh brother, big brother! Maybe this new Xbox won't be spying on everyone after all. "It is not always watching or always listening," a spokesperson for Microsoft told me over e-mail while I was trying to nail down some facts for a story about next-gen consoles that ran in yesterday's New York Times. In the Times article, I reported that Microsoft says the Kinect can be turned off. The entire console can be powered down. This might seem obvious to anyone familiar with how consumer electronics work, but... let's face facts...the Xbox One has seemed, for the past week, to be a tad different than the average piece of consumer electronics. "Yes, you can turn the system completely off," the Microsoft rep said. "This would use no power and turn everything off. We’ll share more details about how it all works later." I believe this powering off involves the aforementioned power button. Last week, Microsoft did not present a vision of an Xbox One that can or should be turned off. Rather, the company showcased a console that could be "always-on" and managed to freak out enough people who started envisioning an Xbox One that seemed capable of spying on its users. Microsoft: "We are designing the new Kinect with simple, easy methods to customize privacy settings." The spying concern wasn't groundless. The new Kinect can see in the dark, pick out human voices in a noisy living room and read your heartrate just by looking at your face. It was unveiled by Microsoft last week as a fixture of the fall-releasing Xbox One. The thing has to be plugged in for the console to work, and is in some way already checking out what's going on in the room it's in. Even when ostensibly not functioning, the Xbox One can run in a low-powered state, ready to be snapped on at a moment's notice. That's something Microsoft was showing off last week as an asset. The only on-switch Microsoft showed for waking the machine from its low-power state was a voice command... "Xbox On." The Xbox One could only hear that if the Kinect was already, always listening. The idea that the Kinect might always be listening got people reaching for their tin foil or vowing to not let an Xbox One into their home. 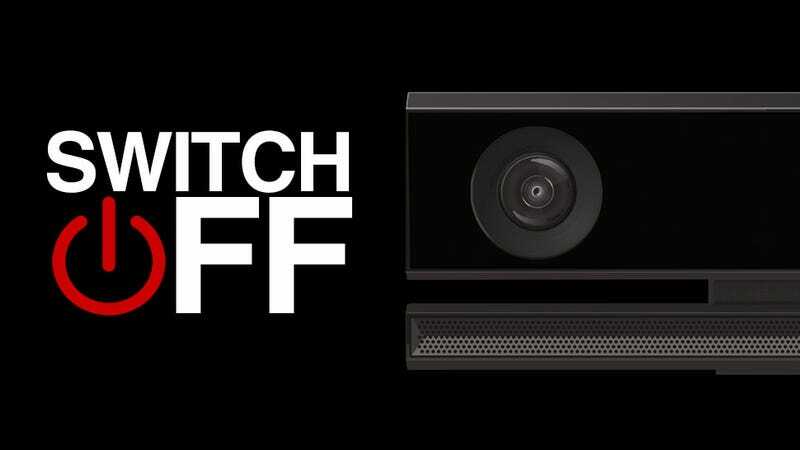 Microsoft is now seeking to calm concerns that the new Kinect might spy. "We are designing the new Kinect with simple, easy methods to customize privacy settings, provide clear notifications and meaningful privacy choices for how data will be used, stored and shared," the Microsoft rep told me. "We know our customers want and expect strong privacy protections to be built into our products, devices and services, and for companies to be responsible stewards of their data. Microsoft has more than ten years of experience making privacy a top priority. Kinect for Xbox 360 was designed and built with strong privacy protections in place and the new Kinect will continue this commitment. We’ll share more details later." Answers about the Xbox One beget more questions. Blame our endless curiosity, Microsoft's confusing messaging or just the complex nature of the new console. It's useful to know that Xbox One users can turn off the console and its sensor all at once without having to, say, unplug the machine. But it's still hard to tell how watchful the Kinect will be during gaming and other uses of the console. The Xbox 360's Kinect was easy to baffle or block. Players had a leg up on it and could easily maintain their privacy. The sensor didn't have to be plugged in for the console to work. When it was plugged in, it didn't have to face the player. Most games didn't even require it. Xbox 360 users could leave the Kinect unplugged or even block the device's visual sensors if they just wanted to use its microphone for voice commands. The new Kinect seems like it will be trickier to foil technologically, making Microsoft's promised privacy settings all the more relevant and essential. The new Kinect's vastly-improved sensors can identify its users in the dark and even track which controller they hold in their hands. The new sensor can tell when a user smiles or turns away from the TV and can react. It's unclear if the new Kinect must see a player in its view during their play session or if it can handle being obscured. This is partially a policy decision by Microsoft, which will get to decide whether to require persistent Kinect-based facial recognition to log a player in or, a la Xbox 360, will settle for button prompts. Microsoft is promising more information about all things Xbox One at E3, the big gaming show that is now just two weeks away.